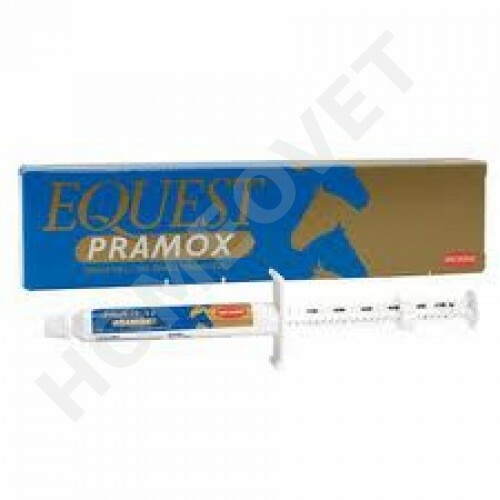 Equest Pramox contains moxidectin (Equest) and praziquantel for the control of tapeworm. As a palatable gel, Equest Pramox controls, with a single dose, the three types of parasites that can infect your horse: roundworms, bots, and all 3 species of tapeworm. It is also the only combination wormer to control all stages of encysted small redworm larvae; larvae that burrow into, and emerge from your horse's gut wall: the harmful and potentially fatal stages of the most common parasite to affect your horse today. Not suitable for pregnant mares and foals less than 6.5 months. Withdrawal period meat and offal 64 days. Manufacturer, Fort Dodge Veterinaria SA Carrretera. Equest Pramox is a unique combination equine wormer. Containing moxidectin (the unique active ingredient of Equest) and praziquantel , it is the only combination wormer to control with a single dose: roundworms, bots, all 3 species of tapeworm, and all stages of the harmful and potentially fatal encysted small redworm larvae. A palatable gel, Equest Pramox is presented in an easy to use syringe, and has a 13-week dosing interval. It is suggested that Equest Pramox is used in the spring and autumn, as control of tapeworm is recommended every 6-months. And Equest, licensed to control roundworms, bots, and all stages of encysted small redworm larvae is recommended for use in the summer and winter. Prescription required produkt- Homeovet Vet.Practice free prescription service. Syringe contains sufficient gel to treat one 575kg horse at the recommended dose rate (0.4mg moxidectin/kg bodyweight and 2.5mg praziquantel/kg bodyweight). Safe to use at the recommended dose in foals over 6½ months of age, mares, ponies and horses. To avoid overdosing, care should be taken to accurately dose foals, especially low bodyweight foals or ponies! Horses must not be slaughtered for human consumption within 64 days of treatment. Do not administer to young foals less than 6.5 months of age. Do not use during pregnancy and lactation in mares.